Easter Eggztravaganza 2 is rated 3.0 out of 5 by 29. Rated 5 out of 5 by Kimmycoo from Egg Hunt Lovers! I love these games. Sometimes you just want things simple. I love finding the extras in these too like the eggs or hidden mini games within the scene. I love the beautiful and awesome scenes. You can get lost just with the artwork alone. The game developers for this and the others like Vacation Adventures-Park Ranger and the Christmas and Halloween ones, all of them are great. I own them all. These are all great for the kids and adults alike. Ive downloaded this one and part 1 in honor of Easter. The re-play value is superb. Ive played these every year when the holidays come around, it helps you to get in the zone and each time you play them you dont remember what the scenes looked like or what is going on, so that makes it feel like a new game each time! Rated 5 out of 5 by Karavan from A fun game for kids I thought this was a charming game. Definitely hard enough for upper elementary, perfect for lower elementary but fun enough for little ones. Reading is needed in some spots so a little help for the non readers please. Vocabulary is sophisticated enough for older kids and adults. Pictures are small so a little hard to find sometimes even for adults. Just fun, relaxing and oh so positive with good images all the way. It brought back happy memories for me. I only did the trial but if I had kids or grand-kids at the elementary school level I would buy this in a heart beat. A sweet game! Rated 5 out of 5 by KiraGilbert from Really Cute and Fun I find the hidden object scenes harder in this game than the other hidden object games. I find it to be really cute and fun. It has so many puzzles and activities that remind me of the things me and my family used to do for Easter. Its really more of a game for children than adults or teens, but I enjoyed it. Rated 5 out of 5 by Alee7383 from Great for the Kids I cannot get over how critical the people are on here, of course its not for adults, the title alone should have told you that. This is a really good game for children I believe they will enjoy it, it certainly can be taught to little ones, I believe the ages 1 to 2 yr olds would get a kick out of the pictures and the sounds of the farm animals, thats if the mom/dad would take the time out to be with them. Its a good game, enjoy it with the kids. I like checking these out so I can tell those that have small children to try it. Rated 5 out of 5 by GothicMomma from Cute, fun to play, the mini games were fun, doing the mini game while searching for the hidden object was fun I will recommend this game!!!! Rated 4 out of 5 by soul4ever from A fun relaxing HO game. I love all these holiday HO games of this series, they are cheerful simple HO games and having no expectations of it to be too much complicated like other HO games, they deliver the right amount of "look for HO in the scene" moments for me, and I like this a lot. As opposed to your regular story based, often dark story/scenes kind of games this one does not require you to save anyone from anything evil. It is a laid back kinda game, and as such the music is all happy easy on the ears, hint system is helpful, you get all these flowers popping out at you when you're done with the scene, they tell you you did good, you get bonus points if you're done with the scene fast enough, but I didn't care for the time bonus, you get to collect eggs with a chick in it, some easy puzzles and in one scene there was image of the famous Leonardo Di-Caprio funny walk. Look for it in one of the float scenes. This game is suited for all ages. Rated 4 out of 5 by Snowfoxx from Wholesome holiday fun! There are most likely going to be many holiday themed games out there this week, but this fun little hidden object game was a nice break from the darker mysteries we are used to seeing. 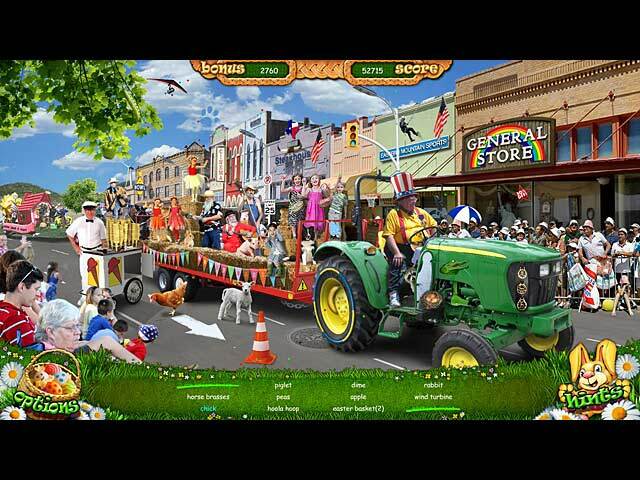 This game focuses on two kids from the Heartland, Emma and Mike, and the fun they have in being part of the Easter celebrations out on the farm and in their town as they join their classmates on a fun springtime field trip. 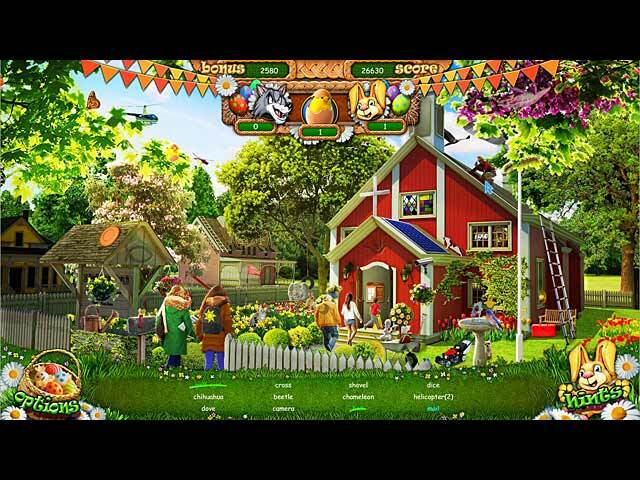 This game is filled with just about everything that Ostara is about, the flowers, candy, farm animals, painted eggs, both from the kitchen and the Faberge' designs. Little logic puzzles, spot the differences, and other kinds of visual mini-games. This game is perfect for everyone, and the kids will love it, especially if they are fans of the Highlights for Children magazines, because this game has many of the same features as that classic schoolroom periodical. 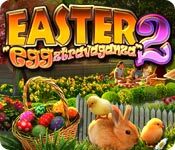 If the kids are looking for something to do after the Easter Egg hunt, then download Easter Eggztravaganza 2, and it will keep them busy for quite some time. This is a fun, wholesome game that parents can join in on to help them out along the way. I game the gameplay rating only a 3, because some hidden objects are too well hidden, and some kids might get frustrated by this, but with a family member to help them along the way, they will get over that soon. So, grab a fun surprise for the family along with those Rise of the Guardians, Hop, and Here Comes Peter Cottontail DVDs, because this will be the only big gathering until the summer barbeques start, and May is quite some time off. Rated 4 out of 5 by oceanlady45 from A Relaxing Evening Another great relaxing game. When stressed and just want to clear your head try one of the many awesome games that Big Fish offers. I have bought at least on the average 2 games a month for several years sometimes more. 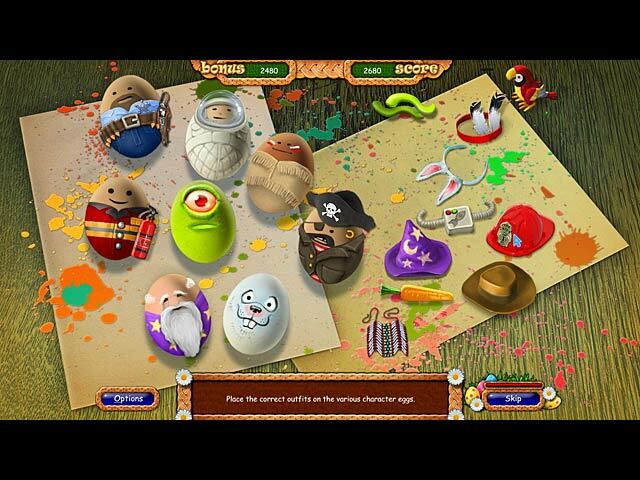 Rated 3 out of 5 by ginger2max from Easter Eggztravaganza 2 A fun low key game but very disappointed because the actual game picture was small and difficult to visualize the hidden objects - in some cases had to use a magnifying glass to determine if I was actually seeing a hidden object! At first I thought I was not playing with a full screen but checked my options and did determine I was in fact playing with a full screen.